Apple has acquired Metaio, an augmented reality startup that launched way back in 2003 as an offshoot of a project at Volkswagen. The company’s site said it stopped taking new customers, and now a legal document shows Apple has bought it. 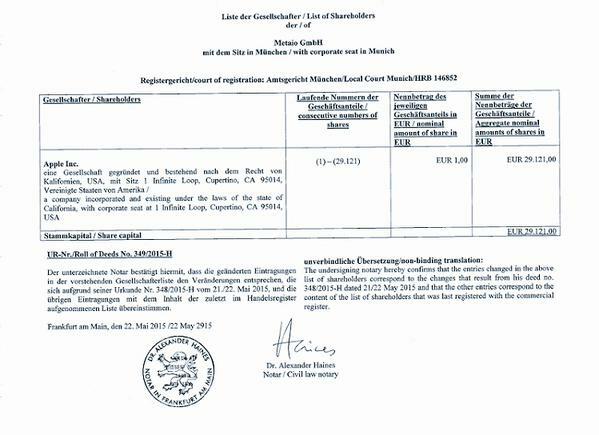 The document confirms a transfer of shares of the startup to Apple on May 21st/22nd. The company began showing signs that something was clearly amiss when it canceled its user conference in San Francisco earlier this month and later took down the company’s Twitter accounts. It also posted on its website a couple of days ago that it was ending purchase of products and subscriptions. Email tech support ends June 30th. Our senior writer Josh Constine went to Metaio’s San Francisco office yesterday to investigate, and a nervous employee refused to speak with him and shut the door in his face. A source told TechCrunch that clients who use Metaio are “flipping out” after seeing the shut down message on the website and not hearing a word from the company about what’s going on…until now. Metaio hadn’t taken traditional Silicon Valley venture capital, but had raised some money from Atlantic Bridge and Westcott. And this one for travelers in Berlin to see what the scene they are looking at would have looked like when the Berlin Wall was up. The program uses historical footage that you can see by pointing your smartphone or tablet at a particular place. Metaio boasts a big community of developers with a 1000 customers and 150,000 users worldwide in 30 countries. All of them are wondering what’s up right now. The acquisition could help Apple bolster its virtual reality and augmented reality efforts. Earlier this year, Apple patented a VR headset that works with iPhones. And yesterday, 9To5Mac’s Mark Gurman reported that Apple is working on an augmented reality feature for its Maps app that lets you point your phone at a street to see what business are around, or a restaurant’s exterior to see the menu or specials. Metaio’s technology could certainly aid with that. Many, including Facebook’s Mark Zuckerberg, have called virtual reality the computing platform after mobile phones. Apple has found enormous success as a platform for desktop and mobile computing with OS X and iOS. Acquiring Metaio could help it power what comes next.